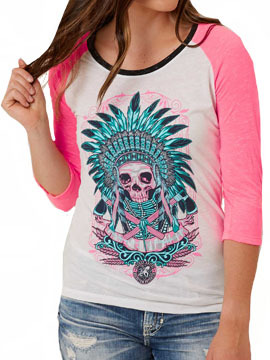 Secret Artist Skull Apache womens long sleeve scoop neck raglan t-shirt features a large hand drawn image of a Native American Indian skull, feather headdress, bone chestplate and two crossed tomahawks on the front. This white raglan shirt features pink sleeves and navy blue collar. 95% polyester 5% cotton, light weight, slim fit. Garment dyed with silicon wash for soft feel. Color: white with pink sleeves.